On this occasion, we have the great pleasure of interviewing Peninah Zilberman, founder of "Tarbut Sighet Foundation"
Peninah created the "Tarbut Sighet Foundation" in 2014, which organizes trips to Maramures, a region in Northern Romania which hosted a large Jewish community before World War II. It was also home to Peninah's maternal grandparents. The foundation also educates about Judaism, Holocaust, and Israel. AEPJ: Peninah, you visited Romania for the first time in 1998. You was living in Canada at the time. Explain us, why did you go to Romania? What did you expect about this trip? Explain us a little bit about your roots. Peninah Ziberman: I was born in Israel during the 50's, which were the hardest years when the State of Israel was just established. At the time, Israel welcomed thousands of new immigrants mostly WW II - Holocaust survivors. Among them were my parents,from Romania. My mother of blessed memory from Northern Transylvania- Sighet Marmaures. 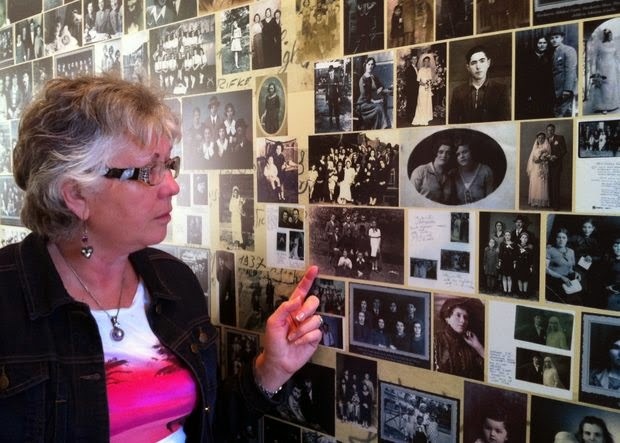 All the Jewish population was deported to Auschwitz, where most of the family members were murdered, only three children survived- my uncle, aunt and mother. My father of blessed memory came from Romania's capital Bucharest, his parents and brother and members of their family survived. Historically, only the Jews from Transylvania and Bucovina including Iasi were deported either to Auschwitz or Transnistria. My grandparents, being new immigrants not Hebrew speakers spoke to me only in Romanian. Since they were uprooted from their lovely home and life style they loved so much, they would tell me stories about the family and places in Bucharest. In 1998 following my tenure as Director of the Holocaust Museum in Toronto, I went to Romania with an open mind and ticket. I always knew that one day I will visit, there was some kind of a spiritual attraction to the country. No expectations what's so ever. However, serendipity has its own surprises. When I arrived in Sighet, my mother's birth place, I discovered a first cousin of my mother, who no one told me about her. I admire her tremendously, she told me all the family stories my Mom never was able to speak about. It?s an amazing experience to listen to her talking about all our families. One of the most interesting aspect is getting to know names which were popular or repeated in our families. Another remarkable experience was for me to walk in Bucharest along the streets while remembering my grandma's related stories, even today whenever I am walking in Bucharest I kind of hear grandmother speaking to me. AEPJ: You grew up in Israel, but, as we know, your first language was Romanian, as you spent your childhood in your paternal grandparents company, who were nostalgic about their years in pre-war Romania. So, what's your "home"? Peninah: The word "home" has a few interpretations, where you were born or where you live - permanently, Personally, I no longer have a real "Home", I make "home" wherever I stay. Israel- is my first home as the birthplace- of a proud Jewish Israeli, Canada- is the home where as a young adult started my professional career, build a family and was an active member of the Jewish Community. Since my retirement the term "home" is no longer a concrete place, Romania has become my 'Mission' home, since the establishment of Tarbut Foundation. AEPJ: Peninah, as a meticulous storyteller, talk a bit about the History of the Jews of Maramures. Peninah: Jews arrived in Maramures beginning of the 17th century, when Hungary was still part of the Ottoman Empire, and continued during 18th & 19th centuries. Most Jews emigrated from Galicia due to the harsh economic conditions and waves of anti-Semitism. Sighet become the religious and cultural center for Maramures Jews. In 1870 about 2,500 Jews lived in Sighet. Jews in the villages engaged in agriculture and merchants contributed to the city's prosperity. Maramures Jews were characterized by fully observing Jewish traditions, simple living, sometimes on the verge of poverty, in culturally enclosed Jewish communities, and Jews who devoted all day to religious studies while admiring their spiritual Hasidic leader. The Sighet Rabbis, blocked modern trends from influencing their congregations. To maintain the Orthodox lifestyle the Sighet Rabbis led and supported the Yeshiva in which hundreds of students studied Talmud most of the day. At the same time, a small group of Orthodox intellectuals, influenced by the enlightenment, established a cultural center in Sighet. In mid-1870s its members published two Hebrew newspapers. By the end of 19th century Jewish immigration increased and the number of Jews in Sighet reached 7,000, consisting one third of the city's population. The newspaper industry was soon dominated by Jews which served as printers, journalists, editors and publishers. Sighet became known as a printing center for religious books, manuscripts from NYC were sent to be printed in Sighet and shipped back to NYC. Following WWI Maramures recovered from an economic crisis. By 1920 the Jews regained their strength and its 11,000 Jews made up almost half of the town's population. At that time Zionist activities intensified in spite of the Rabbi's objection. Although most Jews adhered to tradition, many joined Zionist organizations; others joined non-Zionist Orthodox organizations, the Jewish party or non-Jewish socialistic organizations. The 1920s and 1930s were characterized by cultural activities. Jewish boys and girls attended the municipal schools in addition to their traditional studies. Jewish painters and sculptures exhibited their works, musicians played in concerts halls and coffee houses and Jews established their own choirs. Local and visiting actors performed Jewish plays at the theater and Jewish and non-Jewish movies were shown at the cinema. Authors wrote prose and poetry, public libraries were packed with youngsters reading whatever they could put their hands on, and lectures were given by prominent Jewish intellectuals. Jews established a football and tennis team that competed with other Jewish and non-Jewish groups. This activity was well documented in the literary and cultural magazines published during the 1930 until the Pre-Holocaust regulations came in effect. During hundreds of years since the Jewish community of Sighet was established, it always had a good relationship with the non-Jews. Children shared the same schools, streets and playgrounds and grown-ups interacted and worked side by side with non-Jews. In the late 1930s as anti-Semitic regulations were imposed, this has been drastically changed. In 1940 northern Transylvania, Sighet included, was annexed to Hungary, and even worse decrees were enforced. Compulsory service in the Labor Battalions was enforced which many Jews didn't survive. In mid-April 1944, after the Nazi regime took control over Hungary, all Jews were ordered into the Sighet ghetto and between May 16-22 all Jews were deported to Auschwitz; of the 17,000 Jews residing in Sighet before the Holocaust only about 2,000 survived. Some survivors returned to Sighet and tried to rebuild their community. However, due to the communist regime most Jews preferred to immigrate to other countries, and by the mid-1960s only a handful of Jews remained in Sighet. Today, the Jewish Community caters to about 20 Jews mostly survivors in their late 80?s, and about 120 Jews, (where only the father is Jewish). This is only one example what has happened to a prosperous Jewish successful Community , therefore its extremely important to revive at least once a year Jewish Heritage Day. AEPJ: In the summer of 2013, after several trips to Romania, you decided to organize a big event in Sighet commemorating the Jewish deportations. You was planning to organize a walk from the house of Elie Wiesel to the train station, where they were deported. Wiesel is a Romanian-born American Jewish writer and activist and Holocaust survivor, who was born in Sighet. Finally you organize the event in May 2014. 120 people from around the world attended the four-day event. They were people whose grandparents or parents were born in Sighet, or people who were born themselves in Maramures. Talk us a bit about these times. Peninah: While sitting and writing in my diary at the restaurant next to Elie Wiesel House, all of a sudden it downed on my - Next year will be the 70th Anniversary to the Jewish Deportations - like someone was yelling or calling loudly to me 'you must do something! '.Immediately with a colleague of mine in Sighet, requested a meeting with the Mayor. He was away on holidays, but an assistant listened to me and promised to pass the message. She definitely did; just that the Mayor's response came a few months later, ?Yes, go ahead?. Time was of essence, however with providence and faith, people with Marmaures roots from all over the world heard and registered. We were blessed with about 20 survivors from among over 100 people, who told stories, sung Sabbath songs they remembered while growing up in Sighet. Shared happy memories before the deportations, about their cultured and relatively good economic life. The First Gathering was a real "Coming Home" event for many, closing "Life Cycles" on behalf of their parents and the families which didn't return. Since then we organized similar Gatherings in 2015, 2017 and the upcoming one in 2018. Next year in 2019 we will be observing "The 75th Anniversary to the Jewish Deportations", however, as survivors age or are no longer with us we look forward to welcome second, third and even the fourth generations who know their family roots. AEPJ: Why did you created the ?Tarbut Sighet foundation?? What were your objetives? Peninah: As a Jewish educator specializing in the Holocaust era, and knowing that due to the former Communist Regime in Romania, the Holocaust subject was taboo, I felt that this specific historical period cannot be omitted from the post-revolution(1989) generation.. Romania recognized the 'Romanian Jewish Holocaust' only in 2002; following Profs. Elie Wiesel report, and one of the EU conditions. During the 2014 Gathering, I realized how much the locals don't know about the Jewish involvement pre-WWII, not just the adults but definitely the younger generation. Fundatia Tarbut Sighet- Cultura si Educatie Iudaica, in Romanian it means exactly the Foundations objectives. - To serve future Jewish generations from the region, organizing Gatherings, Promoting 'Marmaures Routes to Roots' journeys and Genealogical services. - To educate the senior and young generations in the region about the vibrant and highly cultural Jewish Community Pre-WW II. - Why they no longer their neighbours? - Where are they today? - How can we observe their memory? etc. All teaching is done through cultural events e.g. plays, music- concerts, films, exhibits, translating books written by Israeli second generations or survivors and historians. Many of our programs are co-sponsored with the Sighet City's Cultural House, library etc. We have been very successful reaching out to schools and educators. Teachers are inviting us to come and speak to the students as well as when observing International Holocaust Day January 27. Last year we were able to take a small group of students and educators to Auschwitz. This was a remarkable experience for all participants, which continued at the various schools with presentations at school assemblies and at the local media. AEPJ: Penninah , how you would define the historical overview of the European Cultural Days in Romania? AEPJ: Last year, during the European Days of Jewish Culture, just in Romania, involved 9 cities with a participation of 1,300 people. These are huge figures for a cultural project. What are your future perspectives on the Day, is there room for further growth? Peninah: Definitely- The more the Better! we should always aim to expand our programs in new geographical regions across Europe: trying to plan a program in as many former Jewish Communities as possible, regardless if there are Jews living today in these communities. Most of the former Eastern Block countries, due to the strict Communist regime were not allowed to celebrate any religious holidays ( Jewish or non-Jewish), therefore there is much to offer and teach via a simple Jewish Heritage Day- with the hope that the event triggers interest for more to explore. For me personally, the European Heritage Days are a Commemorative symbol to the highly cultural life the Jewish Communities led prior to their deportations or immigrations to Israel, USA etc. AEPJ: Do you think that there is a need to establish strategies at European level or is it very difficult to take into account the diversity of different national realities? Peninah: We are the "People of the Book", the more diversity a more interesting result. It definitely makes logistically much more difficult, however the end result could be extremely creative. I would like to suggest the establishment of "Regional Coordinators". This process has a few advantages. First and foremost the coordinator speaks the same language and understand that specific community- their past present and what direction can the group head into. The coordinator serves as a mentor, guide, leader providing also emotional support to avoid the overwhelming feeling for the organization- meeting deadlines, completing forms etc. Highly recommend, every two years ?A coordinators Gathering? to discuss, train, evaluate etc. would be extremely beneficial for the participants development and the project itself. AEPJ: Talk us a bit about your next events, as "SIGHET MARAMURESH ALL GENERATIONS GATHERING" or "Post Warsaw Symposium The Jews of Maramures". Peninah: Since 2014, "The All Generations Sighet Marmaures Gathering" , has become a yearly event organized by Tarbut in cooperation with Sighet City Hall & The Sighet Jewish Community. The objective is to provide a safe space for any descendant who wishes to walk in the footsteps of their ancestors, while learning history, listening to stories and getting immersed in any other aspect of their ancestors lives. The four days Gathering includes visits to the 500 year old Jewish Cemetery, touristic highlights in the Sighet area, observing a traditional Sabbath, lectures by historians, survivors, films and cultural events. 2018 Gathering highlight will be the unveiling of Elie Wiesel copper Bust, sculptured by Ioan Ladea a Romanian master of Bust sculptures. The Sculpture will be placed in the garden next to the Memorial House. This project was initiated by Sighet Mayor, Horia Scubli. "The Jews of Maramures Symposium" was postponed to 2019 Gathering, marking "The 75th Anniversary to the Jewish Deportations". AEPJ: What are your challenges for the future? Peninah: Tarbut is relatively a young eastern European Foundation, we just entered our 4th year. Nevertheless, we have an active profile repertoire. Tarbut's challenge is to find sponsors and Grants which match our objectives. We have not reached out enough to look for sponsors, donors who understand our educational objective, which is to teach and educate the local non-Jewish students. As a result the State of Israel will be gaining new Ambassadors for combating Holocaust deniers and other Anti-Semites promoters. Tarbut, has a number of excellent ideas, however we need funds in order to implement them. AEPJ: Speaking in European terms, how do you value the state of European Jewish culture? Peninah: Pre-WW II European Culture was almost pre-dominated by Jewish influence of Artists, Musicians, Authors, and so on; as soon as Hitler came to power many of the artistic professionals immigrated to USA. Therefore, the Jewish European Cultural scene became very deprived of the once upon a time Jewish European Culture. Jewish European Culture revival began as soon as the Eastern Block was lifted, a number of Klezmer Bands were established, Warsaw Jewish Theatre and Bucharest Yiddish Theatre started to stage Jewish plays in Yiddish. It is necessarily to point out that most of the singers and actors at the Jewish theatres, are not necessarily of Jewish origin, but in most cases the Directors are. Interestingly enough, many of the Klezmer Bands are popular and perform in north America. The Jewish Cultural revival state we are at, has to be continuously encouraged to develop and cultivate the old Jewish Melodies of the Shtetls or any other Jewish Community Perpetuating the Cultural memory. Download the flyer of "Maramures Routes to Roots"